It's fun to have these pictures to compare from last year and this year. It's amazing how much difference a year makes. And even though Liam is not age appropriate for achievements you can still see how much he has grown and how many changes he has made in the last year! That outfit in his first Easter basket was a preemie outfit and it was too big! This year I was hoping to be able to have Liam sit beside me and play in the grass while I worked in the soil. Although it hasn't worked out yet like I had planned, I have still been able to get outside with him and enjoy the many colors of spring. I planted new plants this past fall and have anxiously waited for the tulips and crocuses to burst through. 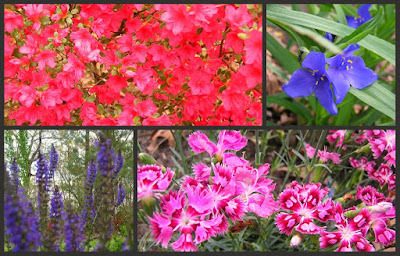 They have come and gone for the year and the yard has burst into color with the arrival of April. We posted something similar. We have made it a tradition to have Elizabeth's picture with her Easter Basket every year, it is sweet to go through each year to see how she has grown. Hang in there Liam will be sitting beside you outside in his own time. Each summer I hoped to take Elizabeth strawberry picking but she was never mobile enough for us to go (and last year she developed a strawberry allergy). This year will be our year and we can't wait. Hi Jen. Liam looks like such a big boy sitting on the couch digging through his basket. He has a lot more coordination then Carver. I was going to tell you about another seat - it's kinda like the bouncy seats. They outgrow the bouncy seats so fast. We found a Fisher Price Infant-to-toddler rocker that fits up to 40 pounds. It works much like a bouncy seat. You can still hang an overhead bar across the top for toys. It plays music and vibrates. I use it a lot for Carver.